Rebel Without a Cause is a 1955 American drama film about emotionally confused suburban, middle-class teenagers. This landmark juvenile-delinquent drama scrupulously follows the classic theatrical disciplines, telling all within a 24-hour period. Teenager Jimmy Stark (James Dean) can't help but get into trouble, a problem that has forced his appearance-conscious parents (Jim Backus and Ann Doran) to move from one town to another. The film's tormented central characters are all introduced during a single night-court session, presided over by well-meaning social worker Ray (Edward Platt). Jimmy, arrested on a drunk-and-disorderly charge, screams "You're tearing me apart!" as his blind-sided parents bicker with one another over how best to handle the situation. Judy (Natalie Wood) is basically a good kid but behaves wildly out of frustration over her inability to communicate with her deliberately distant father (William Hopper). Plato (Sal Mineo), who is so sensitive that he threatens to break apart like porcelain, has taken to killing puppies as a desperate bid for attention from his wealthy, always absent parents. The next morning, Jimmy tries to start clean at a new high school, only to run afoul of local gang leader Buzz (Corey Allen), who happens to be Judy's boyfriend. Anxious to fit in, Jimmy agrees to settle his differences with a nocturnal "Chickie Run": he and Buzz are to hop into separate stolen cars, then race toward the edge of a cliff; whoever jumps out of the car first is the "chickie." When asked if he's done this sort of thing before, Jimmy lies, "That's all I ever do." This wins him the undying devotion of fellow misfit Plato. At the appointed hour, the Chickie Run takes place, inaugurated by a wave of the arms from Judy. The cars roar toward the cliff; Jimmy is able to jump clear, but Buzz, trapped in the driver's set when his coat gets caught on the door handle, plummets to his death. In the convoluted logic of Buzz' gang, Jimmy is held responsible for the boy's death. For the rest of the evening, he is mercilessly tormented by Buzz' pals, even at his own doorstep. After unsuccessfully trying to sort things out with his weak-willed father, Jimmy runs off into the night. He links up with fellow "lost souls" Judy and Plato, hiding out in an abandoned palatial home and enacting the roles of father, mother, and son. For the first time, these three have found kindred spirits but the adults and kids who have made their lives miserable haven't given up yet, leading to tragedy. Out of the bleakness of the finale comes a ray of hope that, at last, Jimmy will be truly understood. Rebel Without a Cause began as a case history, written in 1944 by Dr. Robert Lindner. Originally intended as a vehicle for Marlon Brando, the property was shelved until Brando's The Wild One (1953) opened floodgates for films about crazy mixed-up teens. James Dean's hot red jacket, for example, indicated rebellion, while his very blue blue jeans created a near luminescent effect. 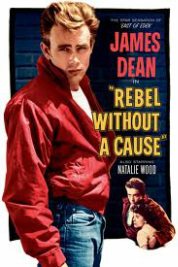 Released right after James Dean's untimely death, Rebel Without a Cause netted an enormous profit. The film almost seems like a eulogy when seen today, since so many of its cast members -- James Dean, Natalie Wood, Sal Mineo, Nick Adams -- died young.